1 What fun! The camping club was sponsoring a BINGO night, complete with prizes. 2 Danny loved to go camping. He and his dad went once each month in his dad's pop-up camper. Ever since his dad and mom had gotten divorced, he missed his dad a lot. Going camping helped with that. Dad belonged to a great group of people who enjoyed camping together. They went on the third Friday of each month. Each month, the club sponsored some activity. This month would be BINGO! 3 First, Danny and his dad and all the club members gathered at the picnic shelter for a potluck supper. The theme tonight was international food. After scarfing down lasagna, Chinese noodles, taco pie, and a piece of German chocolate cake, Danny was ready to play! 4 Mrs. Butler, who was the one who always organized the BINGO game, set out some wrapped prizes. Her son passed out BINGO cards to everyone. 5 "I will tell you what each game will be," Mrs. Butler announced. "At the end of the game, I'll draw a point amount out of a cup, and the winning family will receive that many points. At the end of all the games, the families with the top three highest number of points will receive prizes." 6 Mrs. Butler had made sure the game would be fair by having each family play four cards regardless of the number of the people in the family. 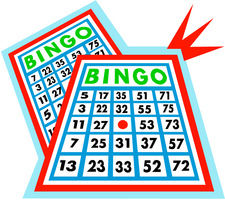 7 "The first game will be a regular BINGO, which means any five squares in a row, column, or diagonally. Let's begin." 8 Mrs. Butler called out a number and a letter, and Danny's dad helped him find whether that number was on their cards. 9 "B-4," Mrs. Butler called. 10 "Dad, we have that one!" Danny whispered excitedly. They placed a clear plastic game piece on the card.